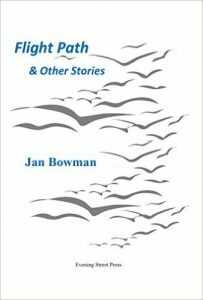 Flight Path & Other Stories by Jan Bowman published by Evening Street Press. As I was reading this fine collection of stories, I was floored by their excellence. The author writes beautifully and the stories are rich and redemptive. They give so much in such tight, concentrated packages. The symbolism is rich and unforced and haunts long after reading. The characters face complicated sorrows and many deal with violence, explicit or implicit. Only kindness and odd moments of grace save them. I had trouble choosing my favorites. “Mermaids” resonated with me the whole way through. A young girl faces the dissolution of her family even as she experiences a beautifully depicted awakening. Skating Blind’s fascinating ending redeems its sorrowful conclusion. “Flight Plan” is eye-opening for its troubled and troubling characters. It’s not easy to depict a character who deserts her invalid husband and adolescent son and still have you understand and ultimately forgive her for her choice. A salvaged photo from a ruined camera is the moment of grace for all the characters. “After the Rain” charts a tense, sad course before an act of spontaneous kindness opens to the generous and lovely conclusion. The remaining stories are equally gratifying and illuminating. I can’t recommend this collection highly enough. Jan Bowman’s recently published book of short stories, “Flight Path,” is a moving exploration of lives lived on the margin. The back-cover blurb quotes from a poem by Naomi Shihab Nye: “then it is only kindness that makes sense anymore.” Certainly, Jan Bowman approaches the stories of vulnerable human beings with enormous empathy and kindness, whether she is writing about a young girl watching her parents’ marriage unravel, or a woman being operated on for breast cancer, or an elderly woman whose son-in-law is trying to remove her from her home. As difficult as these characters’ lives are, however, the stories always end with a sense of hope for the ways human beings can understand and rescue each other. A story about a father who has lost his son in a museum ends with this line: “His words were a soft murmur that Ted longed to hear.” The same can be said for Jan Bowman’s words in this admirable collection. 5.0 out of 5 starsThanks for the Journey! Dr. Jan Bowman’s “Flight Path & Other Stories” is a delight from beginning to end. The writing is so finely honed that it is at once clear we are in the hands of an expert whose ablility to reveal the subtleties of human emotion reminds me of delicate bird tracks left in sand for me to follow with awe and wonder. All one need do is begin, and the narrative compels itself forward. The stories, each distinct from one another, take on a variety of characters in flux. Whether of their own doing or that of others, they experience loss. Her characters become vulnerable via hits to self-esteem, loss of innocence, relationships, fear of the future, or tragedy, and, rather than abandon them there, Bowman kindly carries them into sometimes just the suggestion of new realms of possibilities at once not-so-good and better than where they began. The quiet desperation of an elderly widow on an isthmus between aging in freedom or living the rest of her life at the whims of her sketchy son-in-law and weak daughter leads her to a creative pathway on which, we can imagine, she will soar. A young roller skater, a diner waitress, a sad and confused teen and others face, and in some cases, overcome loss from a variety of authentic events that illuminate some of the more positive aspects of life’s most difficult issues. I read each story as a separate entity; the collection invites this approach with its wide ranging, fully drawn characters in genuinely complex circumstances. Reflecting on the whole, the stories fit together in the nature of their careful tracery of some of the most delicate of human trauma and its equisitely damaging and life-affirming turns. This collection shines, and I will eagerly look for more by this gifted author. A collection of beautifully written short stories which speak from the heart. Jan has successfully incorporated many emotions and experiences that we all share on this journey. I think “Mermaids” is my favorite story. The short story genre has never been my favorite, but this collection by Jan Bowman is excellent. After I read “Mermaids” and enjoyed it, I decided to slow down and treat myself to a story per day. Over the next ten days, I looked forward to my bedtime story and enjoyed all of them. Bowman’s adult and child characters are diverse and authentic, as are their angst and frustrations as they deal with the circumstances life has dealt them. My two favorites are “Mermaids” and “After the Rain” because the characters’ problems and life situations (a young girl’s parents’ bad marriage and an elderly lady trying to keep her dignity and her home) are realistic and and revealed in an honest, creative way. The stories in Flight Paths & Other Stories reveal the power of kindness. In difficult moments of human contact, explored from childhood through old age, this collection provides a window into the kindness all people seek in moments of sorrow. In her poem Kindness, Naomi Shihab Nye writes that when you know sorrow as “the other deepest thing . . . then it is only kindness that makes sense anymore.” from – “Kindness” in Words Under The Words: Selected Poems (1995) by Naomi Shihab Nye. The dynamic mix of characters in these stories, know much about sorrow. They know it in the burden of a wife looking after her war-damaged husband and the son who confronts her more than 35 years after she abandons them. They know it in the struggle to hide from violence of the world, even though violence finds them. But they do know kindness, too. They know it in the unspoken understanding between a young man and his elderly aunt in the aftermath of a violent murder. They know it in small gestures between friends, and even strangers, after a sudden death, as well as through the unexpected connections found on the other end of the phone or a shared meal. About the Author: Jan Bowman is winner of the Roanoke Review Fiction Award. Her stories have been nominated for Pushcart Prizes, Best American Short Stories, a Pen/O’Henry award. Her fiction has appeared in Evening Street Review, Uncertain Promise: An Anthology of Short Fiction and Creative Nonfiction, Roanoke Review, The Broadkill Review, Third Wednesday, Minimus, Buffalo Spree (97), Folio, The Potomac Review, Musings, and others. Jan’s stories have been finalists or short- listed for the Tampa Review Danahy Fiction Prize, Gival Press Story Prize, Broad River Review RASH Award for Fiction, The Phoebe Fiction Contest and So-to-Speak fiction contest. Glimmer Train named a story as Honorable Mention for Short Story Awards for New Writers. She is working on a new story collection, working title, Life Boat Drills for Women. She has nonfiction publications in Atticus Review, Trajectory, and Pen-in-Hand. She writes a regular blog on her website on the writing life and interviews writers and publishers. This entry was posted by Jan Bowman on Friday, July 15, 2016.